Just a very quick note to thank you very much for your invaluable help with our project. As Charlie Picture says - you are the man! We had no problems at all with the watermaker itself - but, as you know from our call early on in the race, did (and continued to have) problems with air getting sucked up into the system whenever it wasn't flat-ish water (ie: nearly all of the time!). If I did this crazy thing again (which I am considering), I would certainly think about having some type of header tank/pump arrangement so that air didn't get sucked into the watermaker itself. World's First 'Ice Boat' Unveiled Ahead of Record Breaking Arctic Adventure! 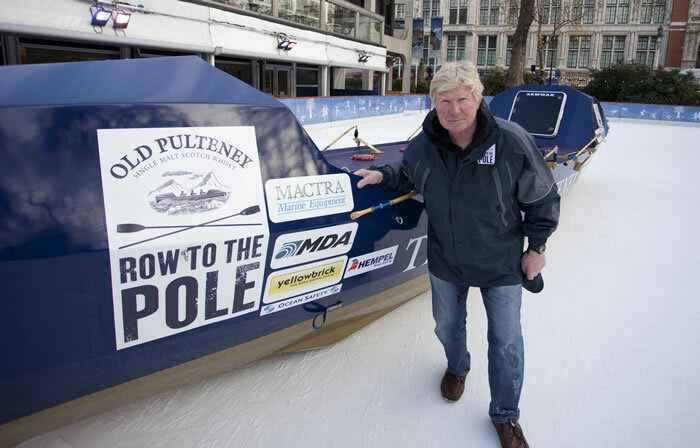 British adventurer Jock Wishart, who is sponsored by Old Pulteney Single Malt Scotch Whisky, unveiled a specially designed 'ice boat' in December 2010 which will be rowed in a pioneering arctic expedition - The Old Pulteney Row to the Pole. The bespoke boat has been constructed to withstand some of the harshest conditions on earth and enable Jock and his crew to conquer one of the world's last true firsts - the first ever attempt to row to a pole, possibly the greatest ocean row ever. The vessel and some of its crew were revealed for the first time at the Natural History Museum's outdoor ice rink in central London, where the boats unique arctic attributes were put to the test. In July/August 2011, internationally acclaimed adventurer and sportsman Jock Wishart will lead a six strong team on the pioneering Row to the Pole expedition. In the bespoke ice boat, they will set off from Canada on a 450 mile route across the arctic on a voyage to the magnetic North Pole which if successful, will make history. The challenge is of global significance as both a pioneering maritime adventure and an environmental expedition and has only now become possible due to the increase in seasonal sea ice melt and its deterioration because of climate changes. The final leg of the journey is only navigable for a few weeks of the year before refreezing and Jock and his crew will be working with scientific research partners to deliver environmental data and insight from the journey. The unique rowing boat, known as "The Old Pulteney", was designed by yacht designer Peter Bosgraaf from Amsterdam in collaboration with Devon-based Hugh Welbourne and Roger Daynes, a leading British sledge designer. This vessel is the first rowing boat in the world to have a "cathedral hull" with sledge runners fitted underneath. This unique feature, combined with attachment points for harnesses, will enable the crew to drag the boat over the ice to" leads" they could row on to complete the final leg of their journey. This gruelling feat was last attempted by Sir Ernest Shackleton in 1916 who was forced to drag his boats to safety over the ice during his Imperial Trans Antarctic expedition. The vessel, which was built in Christchurch, Dorset by Rossiter Yachts, is sheathed in carbon fibre and kevlar to withstand extreme arctic conditions yet remain light enough for the crew to pull. With a planned weight of 900 kilos, its 9.2 m by 1.82 m dimensions were dictated by the size of the plane in Canada which will fly the boat in from Yellowknife to Resolute Bay, Canada (the starting off point for the expedition),on the final stage of its journey from the UK. The Old Pulteney has been constructed to accommodate six crew and their equipment during the four to six week voyage. The colouring of the boat incorporates Old Pulteney whisky's dark blue in its top sides to help absorb heat during the expedition and its golden underside was selected for visibility should it capsize. To reach the magnetic North Pole, Jock, who is a descendant of Scotland's national bard Robert Burns, will row for hours on end in challenging weather and subzero temperatures with little chance for rest or shelter. Joining him will be 36 years old Billy Gammon a British born ex advertising executive who took part in the Indian Ocean race in 2009, South African born Rob Sleep who worked for ten years on a variety of yachts circumnavigating the world and has walked to the Pole on several occasions,36 year old climber, rower and "super yacht" captain Mark Delstanche, a Row to the Pole cameraman and the winner of Old Pulteney's international competition Pole Position, who will be announced at the London Boat Show in January. Jock is established as one of the UK's leading adventurers and explorers, with a successful background in polar exploration, rowing and extreme navigational feats. He led the team which established fifteen new world speed records for powered circumnavigation and captained the team that broke the London to Paris rowing record in 1999. He has a lifetime interest in polar exploration and in 1992 journey he was part of the first team to walk unsupported to the Geomagnetic North Pole. Jock Wishart says: "I've been planning this for over three years so it's great to finally see a truly magnificent boat. The crew now have some serious training to be ready for the voyage and to get the job done next summer." Old Pulteney's partnership with Jock is rooted in the whisky's renowned maritime heritage and history of supporting sailing and seafaring adventure. The whisky is distilled in the historic harbour town of Wick, the most northerly distillery on the UK mainland and the windswept and rugged landscape that surrounds it has given the malt its legacy as the Maritime Malt. British attempt unveiled to conquer one of the last true global firsts. Mactra loaned the team 1 x Schenker Smart 30 12V watermaker & 1 x Katadyn 35 Survivor hand operated watermaker for the event. The East to West Transatlantic Record is the ultimate prize in ocean rowing. Team Hallin is mounting a challenge to not only to beat the current record of 33 days, 7 hours and 30 minutes but to smash it and become the first team to row across the Atlantic in under 30 days. Anthony Smith, an 84-year-old adventurer who walks with a stick, is preparing to cross the Atlantic with his three crew on a raft made of plastic gas pipes. When he placed his advertisement in the Telegraph, he ran the risk of being dismissed as a fantasist. The appeal was brief and to the point: "Fancy rafting across the Atlantic?" Famous traveller requires 3 crew. Must be OAP. Serious adventurers only." But it caught the eye of several experienced seafarers - and now 84-year-old Anthony Smith is preparing to lead his veteran team across the ocean in a vessel made from plastic gas pipes. In a few months the team will push off their craft from the Canary Islands bound for a beach in the Bahamas, 2,800 miles away, on a voyage that would make most people, never mind octogenarians, quiver with fear. 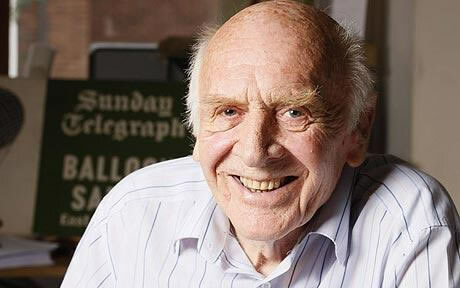 Mr Smith, an adventurer, writer and grandfather, will be attempting to satisfy a lifelong itch to cross the ocean on one of the most primitive forms of transport. In celebration of the first ever pairs row across the Mid-Atlantic Ocean Woodvale Challenge are pleased to announce a new racing event "The Atlantic Allum Cup". On January 12 1971 the Allum cousins left Las Palmas headed for America. A drinking water shortage meant that the cousins had to cut their row short and Geoff and Don Allum arrived at Harrison Point, Barbados 73 days after setting off. Woodvale Challenge is launching the Atlantic Allum Cup on 12th January 2011 - the 40th anniversary of the Allum Cousins pioneering row. Mactra Have supplied 2 x Schenker Smart 30 12V watermakers & Back up Katadyn 35 Survivor manual watermakers for this Challenge. 124 days using a Katadyn 40E 12V watermaker supplied by Mactra Marine. This ocean rowing lark is a bit niche market - more folks have climbed Everest than have rowed across oceans. Just two men had made successful solo crossings before I set out and, in a twelve strong fleet of an organised race in 2009, half the entrants retired. Only nine women have solo'd an ocean - and I was the youngest to do so at 2.4 decades, until 22 year old Katie Spotz solo'd the mid Atlantic in 2010. 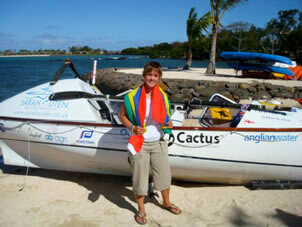 My crossing also makes me the first (and so far the only only) woman & youngest person to solo the Indian Ocean. First there was a 'Warm Up Lap' in which I spent eleven days at sea, looping a massive 400 mile loop from Fremantle, Australia right back to Fremantle, Australia. The weather had conspired against me and the mighty Leeuwin current tested me. I started again on April 1st 2009. Failure isn't failure if you learn some useful lessons. It took me 124 days in my little custom-made rowing boat 'Dippers' to cover the 3,100 nauties (nautical miles) to Mauritius, arriving in time for tea on August 3rd after the most incredible adventures of my life. They were some of the most challenging times too, with mid ocean storms, capsizes, encounters with whales and a continuous bid to avoid squashing by container ships. I surfed with albatrosses, passed the time of day with my very own troupe of Pilot fish who escorted me across and was treated to the most incredible sunsets and sunrises I have ever seen. Charlie Pitcher Was the Winner of the Woodvale Atlantic Challenge 2009. A solo entrant he finished in first place in a time of 56 days! Charlie beat other solo rowers, pairs and fours to win the event. Mactra Marine sponsored Charlie by loaning him a Schenker Smart 30 12V watermaker and a Katadyn 35 Survivor Hand operated watermaker for the event. The Schenker Smart 30 worked faultlessly and the Katadyn 35 Survivor was not required. Mactra Marine is supporting Aldo Diana with the loan of a Schenker Smart 30 Watermaker and a Katadyn 35 Survivor emergency watermaker for his singlehanded 3000 mile rowing attempt across the Atlantic in a wooden rowing boat. The 2009 Atlantic Challenge recipient of the use of a Schenker Smart 30 and Katadyn hand operated watermaker is Charlie Pitcher. Mactra Marine Equipment and the Manufacturer Katadyn were pleased to support Steve White of 'Toe in the Water' (www.whiteoceanracing.com) currently participating in the 2008 Vendee Globe. We have had a number of watermakers in the 2007 Woodvale Atlantic Challenge from La Gomera to Antigua, including Niall McCann & James Burge,two rowers from Bristol rowing Komale in aid of Bristol Zoo. Mactra supported Niall & James's row by loaning them a Schenker Smart 30 Watermaker and a Katadyn 35 Survivor hand operated watermaker. 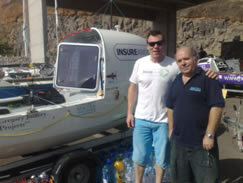 Jim & Ann MacDonald from Mactra Marine Equipment flew out to La Gomera before the race started and gave technical support to rowers who bought their watermakers from Mactra Marine Equipment. Throughout the race Jim was on hand 24 hours a day to receive calls from rowers with watermaker problems mid Atlantic. A number of rowers suffered equipment malfunction which fortunately were mostly resolved by satellite telephone. It has to be said that most of these 'problems' were due in the most part to poor installation or operator error.